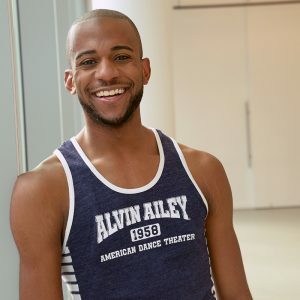 When Christopher Wilson, FCLC ’17, found out that he had made the company of the Alvin Ailey American Dance Theater, he immediately called his mother, who screamed and dropped the phone. “It took, like, a good two minutes for her to come back to me, so I just sort of sat there, just listening to her, and I was also crying at the same time,” he said. By the time he hit high school he was already researching how to get to New York and be near the company. 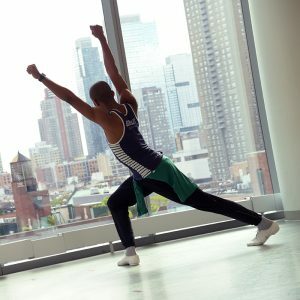 He had discovered the Ailey/Fordham BFA Program, which offers conservatory training in dance alongside a liberal arts curriculum. It became his first choice. He was accepted and received a Founder’s Scholarship. 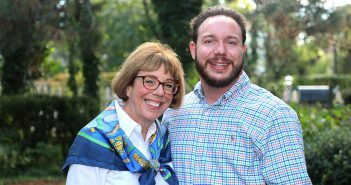 “I think that the Founder’s Scholarship and all of the aid I received, it just made my dreams come true,” he said. When he arrived at Fordham, he recalled, he heard a guest speaker who told students that if they wrote their goal down on a piece of paper and posted it a wall in their home, it would help them realize their ambitions. Every year after, Wilson plastered the walls of his dorm with posters of Ailey II, Alvin Ailey American Dance Theater’s junior company that serves as a bridge between The Ailey School and the professional dance world. Ailey dancer Kanji Segawa walks Wilson through the steps of EN. But making that dream a reality required hard work and focus, he said. And it all paid off when he made it into Ailey II in his senior year and into the main company this past spring. This month, Wilson will be dancing in a production called EN, which was recently created for the company by choreographer Jessica Lang. As the company takes up its residency at City Center for five weeks in December, audiences will get several chances to see the new ballet. “I saw the piece when it premiered, and I was just blown away,” he said of the Lincoln Center opening from this past June. After spending the summer learning the company’s repertoire, this fall he began to learn the new piece. Lang’s husband, Kanji Segawa, also a member of the company, walked Wilson through the steps at Ailey’s dance studios, which sit just down the street from Fordham Lincoln Center on Ninth Avenue. Wilson remembers the short walk between the two campuses as the moment he got to savor New York as his home. He said he very much appreciated having the “college experience that every young adult wants to have,” alongside the rigor of the conservatory. 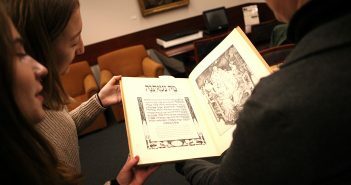 That pairing made him see that Fordham’s “men and women for others” ethos is as an inherent part of being a performer. A still from “EN,” which will be performed at City Center this month. He added that studying dance in New York can’t compare to anywhere else. Hailing from the comparatively small city of Augusta, Georgia, Wilson said his Founder’s scholarship made a “small town boy’s dreams come true” and that he hopes to inspire other young boys like his 11-year-old self. Kathleen Keresey contributed to this article.